Common questions answered. What is a panelized home and how does it compare to stick built, modular, prefab and prefabricated homes? Customization capabilities of Landmark’s panelized homes and what is included. Selecting a foundation type and assembling your panelized home kit. How do I know windows will fit? Interviewer: Hi everyone. 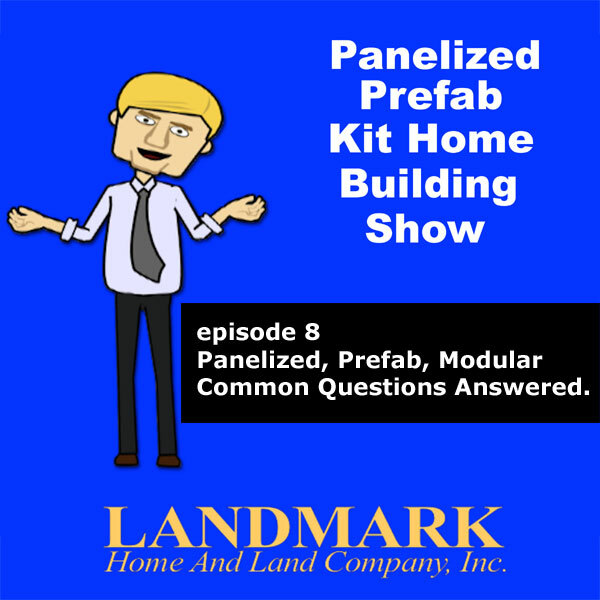 Welcome back for another episode of Landmark Home and Land Company’s Panelized Prefab Kit Home Building show. With me today as he is for every episode, wouldn’t be much of a program without him, the President and Founder of the Landmark Home and Land Company Steve Tuma. Steve, how are you? Steve Landmark: I’m doing great. It’s a nice day today and we’re working away. What do we have? A second round of questions, common questions. Interviewer: I hope you don’t mind but this is – I just set this up to be sort of a part two of a conversation we had earlier where I’ve pulled some common questions from people that have written into Landmark regarding the process of panelized home building. So if you’re good with that, I’ve got a few more questions for you to tackle, if that’s OK.
Steve Landmark: Yeah, let me know what they are and we will get some good answers, because I know there’s a lot of questions out there. People just don’t understand. They have a perspective of how to build – maybe they built 20 years ago. Maybe their friend built. Maybe they watched a TV show. Maybe they watched someone build a house in their neighborhood but it’s always kind of like how does this boil down to – how does this affect me? Steve Landmark: Yeah, thanks for putting me on the spot. Steve Landmark: Well, panelized home is – it’s kind of interesting. It has been around for a little while. We’ve been doing it decades, helping people build their house and it’s basically a more efficient method of building a stick-built home. So for simplification processes, if you had a 40-foot wall in a house, we may make that into five eight-foot sections. So we would put all the studs there, the bottom and top plates on, the exterior sheathing and the rough openings for the windows and doors. You would then assemble the home package and put wall one up. Next, put wall two. Next, put wall three and go around the house and install all the walls and then the roof trusses on top of it. Now of course previously, if it’s on a slab, we put it on a cement foundation or a floor system if you had a crawl space basement or a pure type of system. So the panelization is basically panelizing. Now a lot of people say, “Oh, wow, that’s different. My builder doesn’t understand that.” Well, it’s pretty much the same process of stick building. We just do it in a more efficient method in a controlled environment inside of a production facility. So a stick builder may take a bundle of two-by-sixes, cut them a size, make a wall, put it up. It takes longer. There are mistakes. You’re affected by weather and sometimes it’s just harder to build on a construction site than in a controlled area. So where panelized home systems like ours, the one that Landmark has, is just a more efficient method of stick building. So it’s not affected by the restrictions of modulars, prefabs and all these other words. Now let me jump into something else because this is the part where people that are just learning about different building things, they will say, “Well, that’s prefab.” Well, prefab is extremely generic. If you say prefab, people typically think of those trailers on metal frames that are brought down the highway and brought to a site. Steve Landmark: They may even think of a prefabricated modular. Well, you could have a stick-built home with a prefabricated truss. So prefab kind of covers all of it. But generically, I think people look at it as trailers. That’s kind of like the difference of saying, “Hey, let’s go have some food,” compared to, “Hey, let’s go get a cheeseburger with two pickles, fries and a Coke.” You know, that type of a situation. So what it is, is the panelization just is more specific about it. We’re taking advantage of the production line to create a custom stick-built home. Now that doesn’t mean it gets to be more expensive. It means the efficiencies are there, that make it easier for us to design your home and for you to control the cost and build your home. That’s the key element. It gives you the control and cost through our process and that I think is where it is so with us. It’s not just the actual wood structure of the home. It’s making sure it’s designed properly, engineered properly and energy-efficient. So I guess that’s the long way around of answering it. But I think that’s a detailed one. So people might have to rewind that to hear it or give us a call or send an email. But basically, we’re making wall sections and panels, so that they’re brought out for quicker, easier assembly, minimize the mistakes, minimize the waste, make it easier. There’s a lot of places where you have limited building seasons. You take the mountain areas in Colorado. You take other areas where there’s wet seasons. There’s – and then there are other times where hey, you just want to get in your house. So I think that’s the main definition as we look at it and the benefit of the panelized process. Interviewer: Well, a lot of people might be – I mean it is a little confusing. I mean there’s so many – the vernacular here, there are so many different words. Just run us through a real simple – just pretend I’m a third grader. Give us the difference between a modular home, a stick-built home, a prefab home and a panelized home, which is what Landmark does. Steve Landmark: So modular and prefab, prefabricated – well, prefabricated can be relatively generic. But modular means it’s made in modules. Generally those long rectangular sections that you see going down the highway. They’re made into plans and aligned and brought out. They have restrictions because of shipping, the line size and other scenarios. So generally, they’re back to your designs. Interviewer: You’re limited to what you can fit on a truck. Steve Landmark: Exactly. It’s like going to the car dealer. You can’t say, “Give me a car that’s 16 feet, 3 inches wide, this and this.” You know, they’re kind of like, hey, here it is. Steve Landmark: Do you want a blue one, a red one, big stereo, little stereo, leather seats, cloth seats, whatever? That’s kind of the point of the module where a lot of it is built, brought on site and then the two halves or four quarters are put together to create it. Generally, pretty restrictive in design. A lot of places will not allow them in their communities. There are certain stigmas associated with them. Steve Landmark: Is it worth moving in a month quicker for a house that you’re going to be living in for 20 years if you don’t get the kitchen you want? Steve Landmark: I mean that’s someone’s individual decision. I know with me, I would wait a month to get the house I want. Interviewer: Well, of course. There’s a certain passion to building your own home and that’s – I don’t see much passion in a modular home. Steve Landmark: Right. They work. They do have their spot in certain communities, in certain areas, in certain dollar values. But they’re restrictive overall in the design and what you can do. Stick built is the traditional building method where sticks, you take two-by-fours or two-by-sixes, put the sticks together and make a wall, build a house. That’s kind of the typical custom home builder that you see. You can pretty much build anything. You can design anything. The cost will generally be more because there’s more man labor and putting it together, the details, then also the details that you’re going to add to it. Now some of those could be very simple homes. You can stick build a home that looks like a modular. You can stick build an extremely extravagant home as well. So that kind of puts it out. It generally costs a little more. Prefab, I think like we just discussed, prefab I think is kind of more associated with the trailer modular where they have the metal frame underneath. That’s just considered to be lower cost. You have to determine if the quality is something that you like and you have to see if it’s allowable in your community. They fit a certain segment of the market. Generally those people – there’s something in the cost that they want to do and the size of the home and they’re very limited in designs. Where panelization is closer to stick build but it’s a more efficient method. We’re making the wall panels offsite and bringing them in, so that it’s a quick assembly onsite. It takes less labor. It cuts the labor cost. It cuts waste and little things that people don’t think about. With less waste, there’s less dumpster cost. There’s less clean-up cost. Steve Landmark: There’s less stuff laying around. There’s less situations where people need a two-foot board, so they go get an eight-foot board, cut two feet off and throw six feet away. You know, the little details like that. It’s – there’s a green element to it where in our production facility, everything gets used, down to two inches. That gets used and the two-inch things get ground up and brought to places for animal bedding. So inherently in our process, it’s a greener process. It’s more efficient and our computer SaaS and software programs allow us to optimize the use of materials. So the computer program will go through and say, “Hey, this house needs so many two-by-sixes. How do we cut the two-by-sixes so we get the most usable wood out of the least amount of wood?” That’s a cost savings. It’s easy and hey, it’s good for our environment. Steve Landmark: Yes, we are capable of having designs and that’s one of the things. Modulars are generally restricted on heights. We’ve done ceilings in the 20, 30 feet tall. So there are different ways of developing a tall ceiling or tray ceiling, cathedrals, vaulted, whatever it would be or an open-the-second-level type situation. So we’re completely capable of designing that in. Interviewer: So even if somebody has got elaborate beams, you guys will figure out how to make that work one way or another. Steve Landmark: Right, and that’s where we work in the overall design process of making sure that there’s a design that’s not just – looks good to you but structurally it works. Make sure it works in the budget. Make sure all around it works for energy, efficiency, making sure that there’s space for insulation and other details and also make sure that the plans are clear. So your building department understands them. Your homeowner’s association understands them. Your contractor understands them. If you’re going through finances, your bank knows what’s getting built. Interviewer: Sure. What about – it’s kind of along the same lines. People have their dream ceilings. People also have dream kitchens and dream bathrooms. Can those be designed through Landmark? I mean can you get pretty specific about people’s needs to have that dream kitchen per se? Steve Landmark: Yes, we can work with them and different people have different lifestyles and methods. Some people want a simple kitchen. Other people entertain a lot or other people, their life is around the kitchen. That’s where the family gets together for dinners or get-togethers or holidays or whatever it may be. So yes, we’re completely capable of working with someone to make sure that the space is right for the kitchen. Now the actual kitchen cabinet design, like for bathrooms and kitchens, we would put all the dimensions on our architectural plans and have a suggested layout. They would take that to their local kitchen person, vanity person, whatever and then work with them to fit the details and the space allowed. If they finally need a little extra space, we can adjust our plans and tune them up properly, so that it’s the way that they want them. Interviewer: So basically it’s kind of a two-tiered system here, if they want specialty cabinets. You know, the builder has to make sure that the dimensions and everything are going to be right. You can’t just go out and buy cabinets after the home is built and start throwing them in there. They’re not going to fit. Steve Landmark: Right. We do all that in the planning process. So that’s where we would go through and say, “Hey, for me – you know, when you told us your kitchen was 12 by 12 and there’s a window in the middle of the east-facing wall,” and then they could go to their cabinet designer and work around that. Now let’s just say the cabinet designer says, “Hey, wait a second. You guys are growing your own herbs. Let’s put a bigger little garden window there. We can then change the garden window or the position of the garden window,” or if you find out that hey, there’s a different layout because someone wants the washer in a certain area or certain plate tray or different situation in the kitchen, we can work around that. That’s the key element is we will supply the information to make sure that someone can customize and personalize the home to their exact needs. That’s the key to this. Get what you want instead of getting a house with some of the things you need and then you working around it. Interviewer: That’s great. Here’s a question. What all is included in a Landmark Kit Home Package? That’s a basic question but one that I think most people will be curious about. What exactly do you get in your package? Steve Landmark: We supply the plans, architectural plans, structural design, energy codes, mechanical design if they need it, foundation design, the plans you need – the actual paper plans you need to submit for permits or electronic files if your building department wants them that way and then delivery of the panelized home package directly to your building site. So we’re taking some of the hardest, most in-depth parts, putting them together so that the information across the plans is uniform, approved by your building department and that’s what ends up – we supply in the panelized home package. So it’s easier for inspections. So that’s when we supply the plans and the wood structures. Some people have said, “Hey, it’s the skeleton, the bones, the wood structure, the insides.” That’s what we supply. Other people would – or our customers I would say can then personalize their home. So way back, we used to supply siding and windows. But then what we found out is if you were to build a certain – you know, just take a 1500-square-foot ranch and you were to build it in Florida. You might put a different roof on it than if you took that exact same house and moved it to the southwest. Maybe you put a tile roof on it. Maybe if you went into the mountains, you would put a metal roof on it, so that the snow comes off easier. There’s also different concerns. You build in some of the easier climates, say Tennessee. You’re going to need different windows than if you’re building in the deep desert in Arizona. You know, there are different energy efficiencies. There are different looks. There are different types of windows that do different things and that is the main reason because our customers were saying, “Hey, can I delete the windows?” and after a certain point, I was like, “Why don’t we just do what the customers are telling us?” Let me design the home. Interviewer: Or even down to the faucets in the bathroom. Steve Landmark: Well, that’s exactly the case. Some people might be more concerned about a certain modern look and that’s the situation where someone is able to go through and make sure that they get the house they want instead of saying, “Hey, here’s a faucet. If you don’t like it, change it.” So you’re paying for it twice. Steve Landmark: Just do it right up front. Get the design that you want. Like in the case of windows, get the energy efficiency that you want. In the case of cabinets, get the look that you want, the type of material that you want, the type of countertops and doors and cabinets, carpeting, tile. You know, different situations like that and that’s why – now the key to it is we can put these details into plans. So – and we kind of want them in the plans because if you go put a tiled roof on the house, it’s going to weigh more than an asphalt shingle. Steve Landmark: So we need to have the structural design to know that the roof system will support that additional weight and then as I’ve discussed before, where you put this house can affect the insulation types and there are some places that want to know exactly what type of insulation you’re putting in. Those are things that we can work with and what it really comes down to is people can then understand what it is they’re building, where their money is going and make sure that it’s the actual product and then verify that it’s installed by someone that knows what they’re doing. Steve Landmark: The key elements. Interviewer: Well, it seems like then there’s a good reason why people – you know, Landmark is not going to be supply windows, doors, the siding, as we mentioned roof, cabinets, all the finishing materials. There would be a good reason when building a panelized home to make sure you have all of these elements upfront, so you can just work them into the design. It seems like there’s a lot of reason for that. Steve Landmark: Well, there’s a big reason because in certain places, like the floor tiles are one of them. Someone will say, “Well, I want to put a floor tile in.” So if you go get the typical quarter-inch, lightweight floor tile, it has got a certain weight. But sometimes people in the southwest will put in the thicker tiles that are an inch. Well, how much does that grand piano weigh? Oh, and by the way, you have a fish tank, the 500-gallon fish tank? Steve Landmark: Were you looking at it? We’ve had other people say, “Hey, everyone in my family is 6’6”.” They’re a big family. We want solid floors. So that’s a lot of what we can work with, to get taken care of. Interviewer: Well, that’s interesting. Here’s a question. Can I make changes to the panelized package once I’ve purchased it? Is that possible? Steve Landmark: Yes. Well, there’s a couple of answers to that. You can always make changes. There’s the point of when it’s sensible to make changes and financially make sense and doesn’t create scheduling issues. On paper and the design phase, we can always go do those changes. It’s better to do it before we finalize them in the engineering phases. But if someone absolutely has to have something done for some reason that arises or a building department throws a little curveball, yes, we can do it. You can also change a panelized home once it’s framed. Now just like a stick built home or something else, you got to see how it affects the structure. In some areas – we had a person do this just a couple of weeks ago. They built a garage. Then they decided they wanted another window. Well, in some areas, you can just put that window in. In other areas where homes are engineered, that wall may be a sheer wall. So it might have been built and reinforced certain ways. So when you poke a hall in the middle of it, it may affect the performance of that sheer wall. So in that case, we went through. We got it taken care of with the engineers and he went through to install it. So if you could think about it upfront, it can be done. It’s just a little bit more of a hassle to do it later. But anything can be done but we suggest let’s do the homework upfront. Design it right. Interviewer: So Landmark can’t show up with a chainsaw and just take that top floor off. It’s what you’re saying. Steve Landmark: No, no. That’s not usually the way it works. Interviewer: So dear Landmark, how do I determine my foundation type? Can you explain land, energy efficiency, cost, local customs, et cetera? Steve Landmark: Yeah, there’s a lot of situations with foundations and it kind of depends on where you’re at and what the building conditions are and your building department and energy situations. So sometimes people will say, “Well, a slab is the least expensive.” Just a cement slab, poured cement and that may be the case if you’re building on flat land. But if there’s a slope to the land and you’ve got to make a flat building pad, there’s a cost to do that. So maybe it’s better to go with a crawl space. Maybe if you’re around the side of the hill, it’s better to have a basement, so you can have a walkout basement, you know, type of a situation. So a lot of that can be dictated by the site conditions. A lot of it can also be dictated by local customs. So if you’re building say in Iowa where land is pretty much flat, you can’t put a slab there. But I think you will find locally people will more likely do a crawl space or a basement. They like to have access under the slab to – you know, for storage or for any maintenance of pipes or heat ducts. It’s just customary or they do a basement. You get into parts of California, Arizona and Mexico. Slabs are more typical just because the landowners out there, that’s how they did it. It’s just the way it works. But we have done crawl spaces and basements in those areas. Steve Landmark: And if it’s workable, you could do it. Other people say, “Hey, a basement is just a dark room. I’m never going to go there. So I don’t want it.” So a lot of it, you got to look at the land, the lifestyle, what you choose to do and the cost and just what’s typical for the areas. Interviewer: Here’s another simple question but very important. Dear Landmark, who can assemble my home package kit? Steve Landmark: It’s kind of interesting because their process of stick building is like panelization. They get the materials. They make the walls. They stand the wall up. They brace it. Then they go make the next wall, stand it up and brace it. So that is very similar. It’s just kind of a mindset where maybe they just haven’t looked at it from a different direction. Steve Landmark: So anyone with framing knowledge can put it together. Yes, we have had customers that – or framers frame and build their complete home. You know, everyone in the family gets together and literally touches every component of the home. We’ve also had customers more kind of directed, act as the general contractor and have the local subcontractors build it. So I would say anyone with framing knowledge can go through and do it. Of course if you’ve got an extremely complex home, you’re going to have to have a lot more framing knowledge than if you were doing a simple boxy [0:25:15] [Phonetic] ranch home. Interviewer: Has Landmark ever had to get on the phone with a contractor who had just kind of talked them through any kind of process or –? Steve Landmark: Well, that’s a great question that you developed because it’s – we supply a very clear and accurate set of assembly plans that shows where each floor joist goes, that shows where each wall panel goes. It goes where each roof truss goes. But yes, even so, someone will call and say, “Hey, what about this?” or hey, the customer wanted a change or hey, we’re used to this. Can you clarify what’s going on here? So we are fully available to review any of the assembly plans and the key to it is that those assembly plans are sent to you before the house package delivery. So you can preview them and have an understanding of what needs to happen. So it’s not just a surprise. Hey, here’s a house. We give you the answer in a sense to the assembly. So you can go through and look at it. If there’s any questions, you can contact us and we will review them. But even so, if during the framing phase you have a question saying, “Hey, what about this or that? I’m a little confused,” we can walk you through the process. Interviewer: Right. Does Landmark install the rough openings of windows and doors? I mean it’s a little foggy in my mind still. So if I buy a plan, you guys have those openings within the kit. Once they put up a wall, those rough openings for windows and doors are there. Steve Landmark: That’s exactly right and that’s part of the design process. So in the preliminary design stage, you might say, “Hey, I’ve got a view. I want to have a big window. A six-foot wide, four-foot window and next to it two big sliders.” You will say, “Oh, about a six-foot slider,” or something like that. So we will draw it in to get the preliminary plans worked out. But as you proceed, we will need more of those details. Regular doors like the entry man doors are generally standard sizes. But windows are not. So we might draw in – say you like a typical bedroom window, a three-by-five egress, double hung window. Well, your manufacturer might be three-foot-one-inch by five-foot-one-inch. Steve Landmark: It’s pretty interesting because we work around the country. So someone in the city might just have a little SUV that go in and out. You know, go shopping, run around, bring the kids to school. Someone by the ocean or in mountains might have a kayak. Steve Landmark: And they’re like, “Hey, I want to put the kayak on my SUV. So that when I leave Saturday morning, I just jump in my car and go.” Well, that’s going to need a taller door. Steve Landmark: You know, and then we got to work that in the design. So that’s one of those thing where a lot of people will say, “Hey, can’t I just use a standard window size?” I wish it was. But the window companies are not standardized. Steve Landmark: Some window companies will build to the size that’s drawn on the plan. So there’s kind of a little, “If then, how do we react to the situation?” But that’s one of the key elements. Yes, the rough openings are there. Let me tie something else to that. All those window sizes and everything are tied into the energy calculations. So they know you’ve got so many windows this size, the type of glass and it works. So that’s an important part of making sure that the windows are designed properly. Steve Landmark: Yeah, that’s kind of the situation. There isn’t a standard and here’s something else. I like a lot of light. There’s a view. It depends on what the view is. Are you having a view of your favorite rose bush? You know, which is limited or is it of your favorite mountain range? Steve Landmark: So that’s the situation with the standard window size where we got to – we have to kind of figure out what size will work there. But the actual size of the actual glass unit will probably be dictated by the window manufacturer. Now sometimes we have people do custom windows. You know, if they need a big glass wall where that’s all totally custom-made and custom-framed. But yes, we can do it. That leads to another question. Standard window sizes and structural engineering. You know, if you – you know, what we’re talking about here. If you’ve got a view of your favorite mountain range. We have to make sure that the windows are supported properly and there’s enough strength in the wood around them to support it. So let’s just say you had a – you wanted to have the biggest view of the Sierras and you had a wall that’s 40 feet wide. It would be very hard to put a 40-foot piece of glass in there. Steve Landmark: So sometimes there are situations where maybe we could get 30 feet or two 15-foot sections. So that’s what we have to work in the design elements of someone is pushing something to an extreme. But that’s where we get involved in the whole design concept, the whole engineering, the whole energy code situation, to make sure that the end result, you know, getting you from A to Z, is proper. Steve Landmark: You may understand steps B, C, D but we were looking at the overall picture of how this works. Steve, while we’re talking about windows and big views and glass, that can affect your energy calculations. Interviewer: There you go. Yeah. Steve Landmark: Hey, you want a window. What are you wanting to do with that window? Interviewer: Yeah, that’s so important because just wanting one specialty thing that’s your dream can cause a domino effect in every other part of the building process. Steve Landmark: Right. It’s not a big deal. You just need to let us know about it and we will figure out the dominos in that sense. Interviewer: That’s a good thing. Landmark will figure out the dominos. I think that’s a good selling point. So let’s talk about the website and how anyone interested in Landmark Home and Land Company and the panelized home building process goes about contacting you guys. Steve Landmark: We’ve got a pretty cool website that we’re constantly improving and we’ve got videos on there, so people can watch some of these topics. They can read things. So the podcasts are up there. We’ve got details on – you know, just facts about us, where the panelization process it, what our builders do, plan selections. By the way, you can build any plan that you want. Our website is www.LHLC.com. It’s kind of like the letters for Landmark Home Land Company. It’s Landmark Home and Land Company but the letters are www.LHLC.com. You could call us also anytime at 800-830-9788 and we will go through and help you with what you need. For some of our customers, it’s the first time. Other customers have done it a couple of times or they’re repeat customers and they want to do it again. So we will take the time and work with you, so you understand what it is that we can do to help you get the house that you want where you want to build it. That’s the key. Interviewer: Well, that’s great and Steve, thanks for being here again. We’re about out of time for this episode and it has been a real treat, once again picking your brain about Landmark Home and Land Company and about the panelized home building process. So for Steve Tuma, President of Landmark Home and Land Company and myself, I would like to say thanks for being with us once again and we will see you next time. Steve Landmark: Well, thank you.